These example sentences are selected automatically from various online news sources to reflect current usage of the word 'deflation.' Views expressed in the examples do not represent the opinion of Merriam-Webster or its editors. Send us feedback. 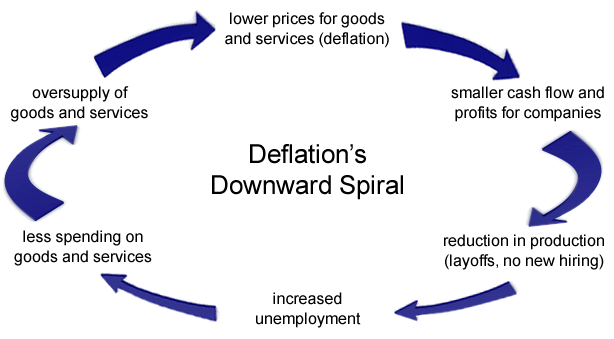 Deflation describes the general decline in the prices of goods and services in an economy, which in turn increase the purchasing power of money. It is the opposite of inflation, but is not the same as disinflation (which is the slowing of inflation). Any way you slice it, deflation is caused by a significant drop in demand. Lots of things can cause this decrease in demand: recession, tighter monetary policy, civil unrest, terrorism, or changes in laws are common triggers. Many economists believe that these causes are often accompanied by a heavy psychological element. As consumers and companies grow more pessimistic about the economy or their standard of living, they tend to hoard cash instead of spending it. Likewise, banks tend to slow their lending and companies delay their expansion plans. These reductions in spending and lending lead to a decrease in the demand for goods and services. Less demand means producers, retailers, and other sellers of goods and services must lower their prices to entice buyers. Although many people laud lower across-the-board prices, prolonged periods of falling prices can wreak havoc on the economy by starting a downward economic spiral, resulting in fewer jobs, less income and a potential period of recession. Because the government can have such a tremendous impact on the economy in this vein, central banks like the Federal Reserve keep a close eye on economic measurements that will alert them of the threat of deflation. What made you want to look up deflation? Please tell us where you read or heard it (including the quote, if possible).